Non-resident Ambassador of Israel Tibor Schlosser and Minister for Agriculture, Rural and Maritime and National Disaster Management, Inia Seruiratu. 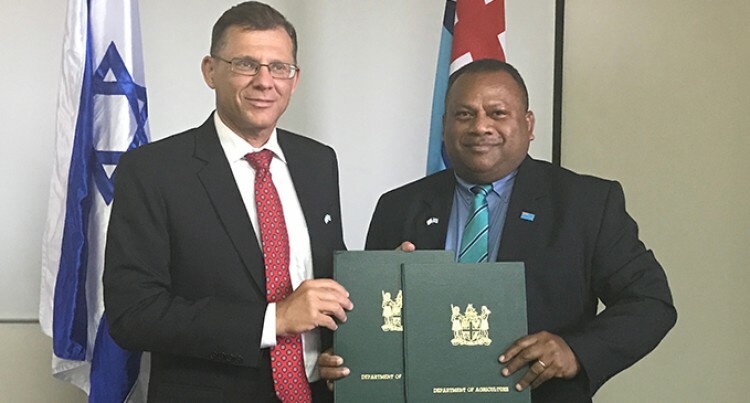 Fiji’s commitment to improve the agriculture sector was boosted with the signing of the Memorandum of Understanding with Israel yesterday in Suva. The memorandum is giving Fijian students opportunities to study and undergo practical phases in Israel from next year. Non-resident Ambassador of Israel Tibor Schlosser said the memorandum qualifies students to undertake educational stints on Agro studies at the International Centre for Agriculture Studies in Israel. The memorandum is the co-operation between Fiji and Israel in various sectors including agriculture, water, food security and sustainability. Mr Schlosser said the friendship between the two nations was not a new one. “We are here to help, share to our knowledge, experience, skills and technology with Fijians,” Mr Schlosser said. Minister for Agriculture, Rural and Maritime and National Disaster Management, Inia Seruiratu, said indirectly more than 200 thousand Fijians benefitted from the agriculture sector. “This is an opportunity for us to access technology and of course benefit from Israel’s knowledge in agriculture of which they are well known for throughout the world,” Mr Seruiratu said. “Government has big plans for agriculture, we are thankful to Israel for considering us – to benefit from and we look forward to it,” he said. “A good percentage of our people are still residing in rural areas with agriculture as their livelihood. Agriculture is very well critical for Fiji. Mr Seruiratu said the social and economic issues we face and most particularly contribute towards the growth and development of our country. Particularly in terms of increasing our contribution towards Gross Domestic Product.